“I don’t really feel safe continuing…” says our guide, Cheo, lowering his machete. He is chopping through a patch of dense Amazon rainforest, looking for an elusive trail leading back to our boat. I stop and look around the small clearing, which way had we just come from? Everything is a mass of tall trees and snaking vines, branches and leaves, and I’m totally disorientated. For the first time on our three-day Amazon adventure, I appreciate the full, epic power of the rainforest. Luckily, Cheo had marked our path with broken branches, and using the sound of the river as a marker, we found our way to a small pebble beach. Cheo wandered back into the forest, leaving us in patch of shade with our Australian companions, Lily and Aaron, to contemplate our fate. Before we got lost, we’d been in the middle of a morning trek, absorbed in the exotic sights and sounds of the rainforest. 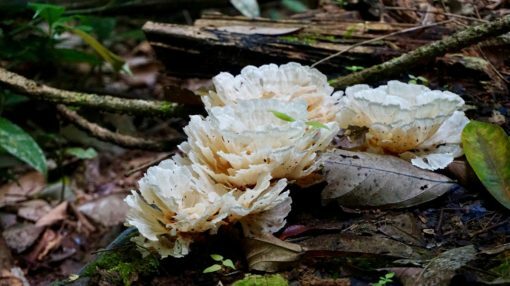 We’d marvelled at orange mushrooms and spiky trees, a flock of brown tiger herons, a troupe of squirrel and capuchin monkeys and most striking of all, a caiman. As we stood on the riverbank, the pre-historic creature glided silently towards us, his bony head resting just above the water, oil-black eyes fixed on us. It’s the caiman we were all thinking of when Cheo returned with a balsa tree trunk, hacked from the forest with his machete. Just then, we heard a shout from the opposite direction and turned to see our boat driver emerge from the forest. The four of us tourists heaved a huge sigh of relief – we were safe. “There are wild pigs on the trail,” said the driver nonchalantly in Spanish, and just like that, our scare was over. Back at the lodge we laughed about our adventure over lunch, but I privately vowed never to wander even a few feet into the forest without a guide. The Amazon rainforest is disappearing at an alarming rate. According to this article, we’re destroying the world’s rainforests so quickly through animal agriculture, logging and farming, that they may be completely destroyed in 100 years. Save the Amazon Coalition reports that we’re losing an estimated 50,000 species per year due to rainforest deforestation, as well as destroying indigenous tribes and possible cures for life-threatening diseases. This is terrifying, especially considering that around 20 percent of the world’s oxygen is produced in the Amazon rainforest. Worldwide, more than half of the world’s species of plants, animals and insects live in tropical rainforests. 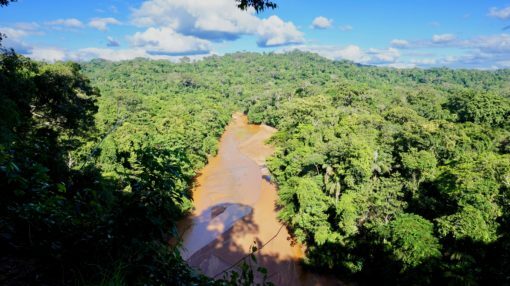 Losing the Amazon will change our planet forever. With that in mind, visiting the Amazon while it’s still in tact was one of our main aims for this trip to South America. Given its precarious state, we also wanted to do so as ethically as possible. 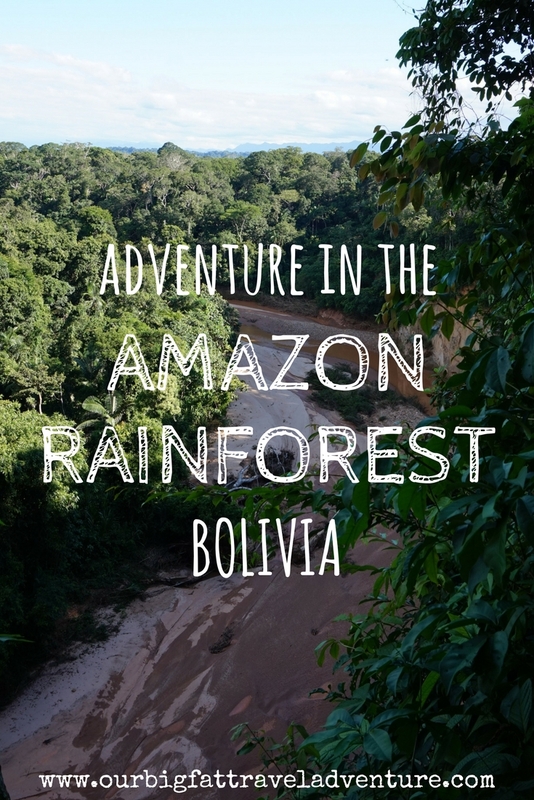 Although Amazon rainforest trips are most popular in Brazil or Argentina, we decided to explore the lesser-visited Bolivian rainforest and spent hours researching how to do so. We read many horror stories about unethical, cheap pampas tours where guides poked, prodded and picked up the animals, fished for piranha, polluted and sensationalised the experience by ‘hunting’ for anacondas. To avoid these tours, we booked a trip with Madidi Jungle Ecolodge, which is nestled in Madidi National Park, one of the most bio-diverse areas on the planet. The lodge is accessible via a three-hour boat ride from the nearest town, Rurrenabaque, and was created by indigenous people who employ all local staff and supports the surrounding community. They focus on conservation and source water from a nearby spring, run electricity for just four hours per day and host a maximum of 18 people. All the buildings are made from natural materials and there’s also no wifi or phone service. Although it was a more expensive option, at £192 per person for a three-day, two-night trip, we were so happy we chose to stay at Madidi. We were part of a group of just four tourists with Cheo as our personal guide, and apart from a few other guests at the lodge, we saw no other people while out trekking. It was an extremely peaceful stay and Cheo was respectful of all the wildlife. Madidi offers two, three and four day tours, which you can book through the Madidi Jungle Ecolodge website. 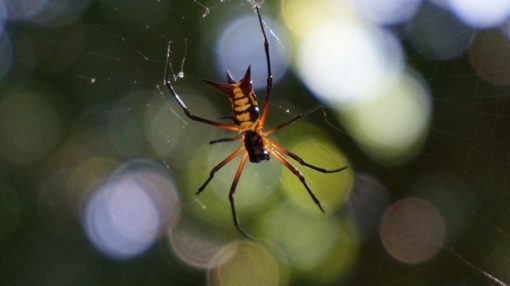 It’s true that we may have seen more Amazon wildlife on a package Rurrenabaque pampas tour, but we wouldn’t have been comfortable with guides luring monkeys with food and poking tarantulas, which are just some of the stories we’d heard about Bolivia Amazon tours. As vegans, we also didn’t want to take part in piranha fishing and Madidi was able to provide delicious vegan meals for us. 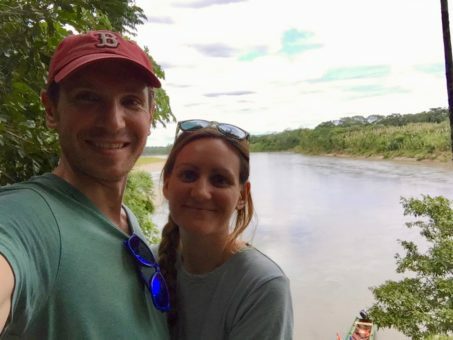 Our trip to Madidi wasn’t sponsored in any way and I’d highly recommend staying with them if you’re planning a trip to the Bolivia Amazon and are concerned about ethical tourism. 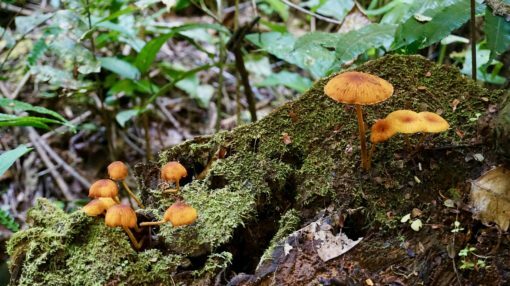 We spent our time trekking through the rainforest with Cheo, who pointed out dozens of varieties of Amazonian plants, from mushrooms that looked like coral to vibrant blue-and-orange flowers. 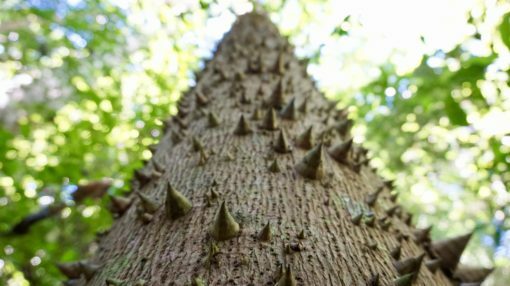 Everything was beautiful yet potentially deadly, even the trees had spikes or were covered in fire ants or strangler vines. 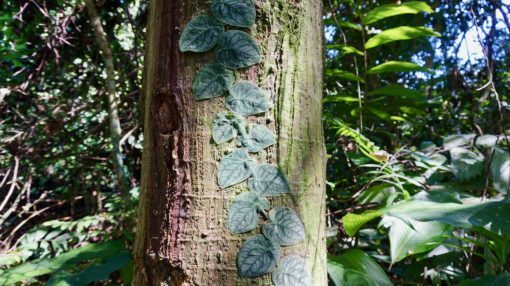 Incredibly, there’s even a species of walking palm tree, which sprout extra ‘legs’ in order to move into areas of sunlight. Cheo collected fruit from cacao trees and showed us barks and plants used for medicine. We watched poisonous hairy caterpillars, long centipedes and ants busily cutting and carrying leaves in thick rivers to their nests. 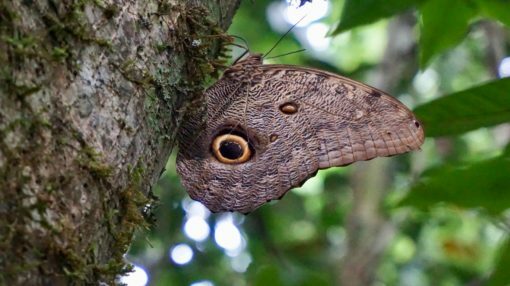 There were intricate owl butterflies and red-and-yellow bull spiders. Through the thick tree canopies we spotted fleeting glimpses of tropical birds, from white throated toucans to electric-blue turkeys and herons. Back at camp, a tapir, rescued by the lodge during devastating floods five years ago, would regularly stroll through. We woke to the roar of howler monkeys in our simple wooden hut every morning. 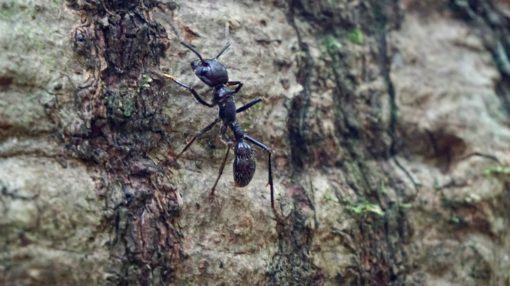 As we hiked along the 40-kilometre network of trails, we saw other species jumping through the tree-tops. One morning, we stopped to observe a group of capuchins and spider monkeys, the former providing protection for the group while the latter searched out fruit. Along other parts of the trail, we caught glimpses of wild pigs, heard their guttural shrieks and smelt their pungent pee. We even saw some jaguar poo disconcertingly close to camp. 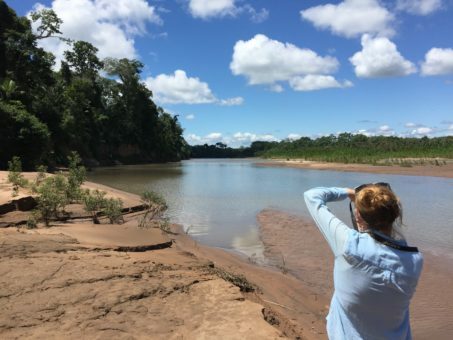 We emerged from our treks at viewpoints showcasing the true scale of the rainforest, acres of greenery bisected by a winding, brown river filled with piranhas, sting rays and caiman. 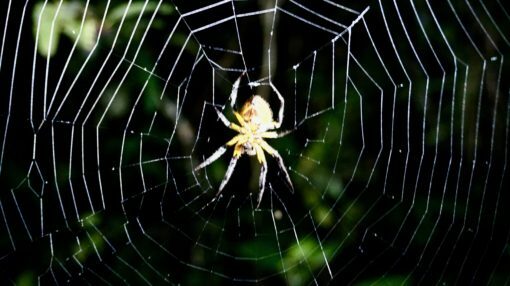 On our last evening, we took a night walk to see the forest transformed with silvery webs, home to all kinds of spiders, from fat-bodied to long-legged varieties. 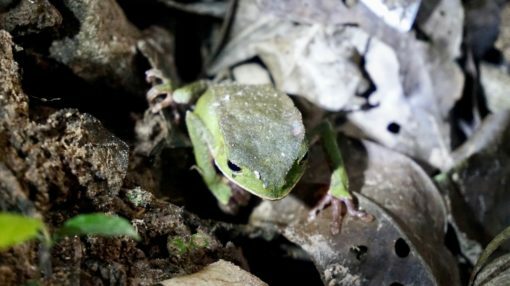 We came across a brilliant green tree frog and a scary bullet ant nest, whose bites cause 24 hours of searing pain. 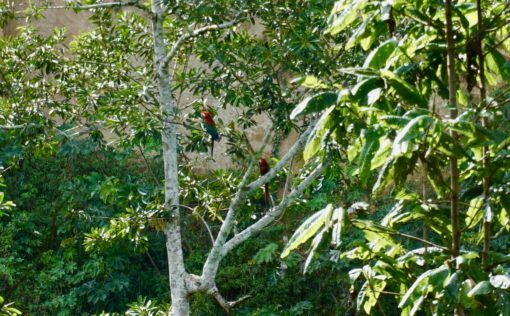 During the boat trip back to Rurrenabaque, we made one last stop at an area of the rainforest filled with macaws. The birds mate for life and were nesting together in a huge wall pocketed with enclaves. Periodically, the red birds would swoop from these spots to land in nearby trees, showing off their blue feathers as they took flight. 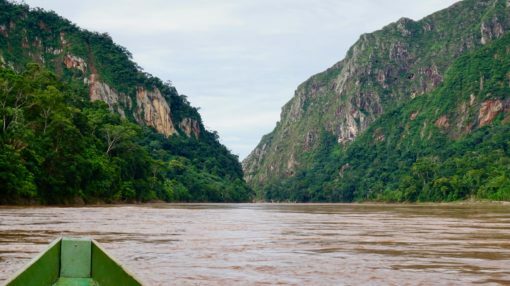 As we sped downstream to Rurrenabaque on choppy waters, I gazed up at the towering, forest-covered mountains and felt so grateful to have experienced the awesome beauty of the Amazon. When to visit the Amazon rainforest Bolivia– the temperature ranges from high 20s to low 30s all year-round during the daytime. April to September is the dry winter season in the Amazon, when the humidity isn’t as oppressive and nights can be cooler, with low rainfall. December to March has the highest rainfall and is the most humid. We visited at the end of March and the days were warm with cool nights and we had no rain, although it did pour the day before our trip. Getting there – you can take a 12-hour bus ride from La Paz to Rurrenabaque, the jumping off point for Bolivian Amazon tours. The journey is one of the most awful in Bolivia, but it costs just $20-30. We opted instead to fly from La Paz with Amaszonas, which cost £62.50 per person each way and takes about 45 minutes. 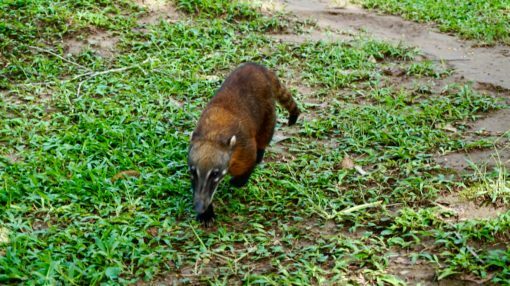 Booking Rurrenabaque Amazon tours – it’s possible to arrive in Rurrenabaque and shop around for tours. It’s an incredibly small town and there are lots of tour companies about. 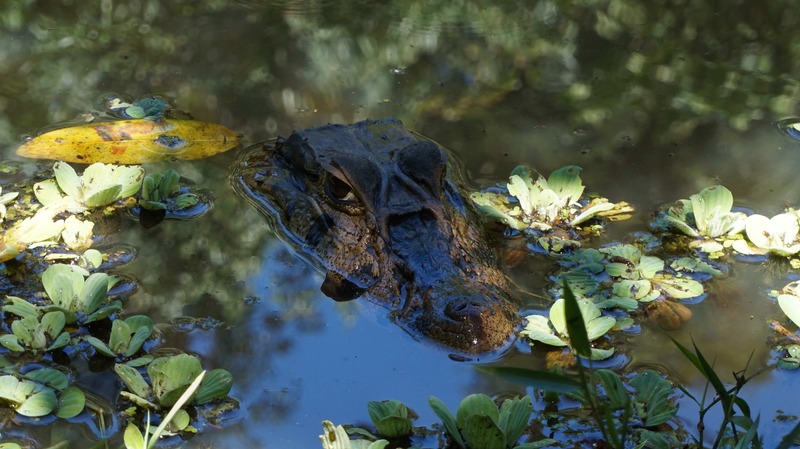 Most offer a one to three day pampas river tours or stays in the jungle for anywhere between $100 to $300. Many of these tours may not be great quality and can have questionable ethics, so ask questions about the itinerary and ethos of the company before you book your pampas jungle tour Bolivia. 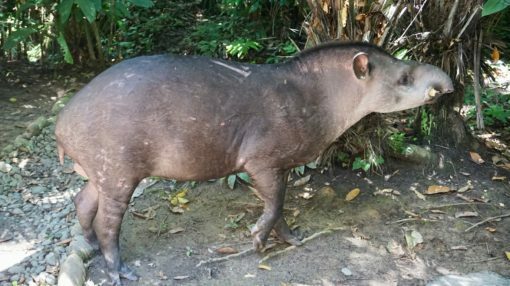 You can also book Rurrenabaque tours online in advance, which is what we did with Madidi Jungle Ecolodge, which I’d highly recommend. 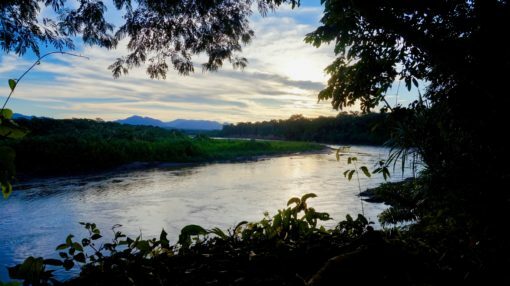 Another ethical company we considered using was Chalalan Ecolodge, the oldest in the national park with a great reputation. Our three-day, two-night tour cost £192 per person and included transfers from the airport, all accommodation, food, transport, guides and activities at the lodge. Rurrenabaque accommodation – it’s likely that you’ll spend the night before and after your rainforest trip in the town of Rurrenabaque. There are loads of hostels and guesthouses available, we stayed at Pampa y Selva Hotel, which cost £22 per night for a double room including breakfast. Our hosts were really friendly and the room was comfortable and clean with an en-suite bathroom with hot water. Check out more hotels in Rurrenabaque Bolivia here. What to take with you – the rainforest is an extreme environment, so make sure to take the following items with you. Insect repellent with Deet, sun cream, long trousers and closed shoes suitable for hiking (our lodge also supplied gum boots), a long-sleeved shirt and torch for the night. Bring a warm jumper for the evenings as it can get cold, we were there in March and had to use blankets at night. Don’t forget a raincoat, since you’re going to the rainforest after all. Love reading your adventures, so inspirational. My wife and I took early retirement to star exploring this planet, doing it small blocks at the moment. Got 5 weeks in Australia, New Zealand and Singapore in January 2019…….can’t wait! Keep the adventures going guys. Hi David, thanks for reading and for your kind words. Your trip sounds super exciting, you’ve chosen some great countries to explore! Sorry to hear that you’ve been sick Louisa, we hope you get better soon, sending you lots of healing vibes. Good to see you’re spreading your travel knowledge to others, we would love to return to Australia one day. Andrew’s parents just finished their retirement trip there and loved it. You should totally work for tourism NSW, you have so much knowledge to share and you’ve definitely educated us about Australia 🙂 We’re really enjoying the nature and rural spots here in South America over the cities, it’s been a great experience. Machu Picchu next week! Yes! I did say to Andrew while we were there: ‘Patti would hate this!’ To be fair, the spiders freak me out too, I kept my coat well and truly zipped up to the neck on that night walk! It was an incredible experience to be in the Amazon though. Wonderful hiking plan that gives me a plenty of pleasure. Such kinds of information help me more to make my trave in the winter.